This class is for those who would like to learn the basics of free-motion quilting or for those who would like a refresher course. We will learn several different free-motion designs and techniques in this class. We will also practice drawing our quilt designs to develop muscle memory. Much instruction an several tips will be given to you so that when class is over, you will have all that you need to build upon your new found free-motion quilting skills. Bring your sewing machine (please make sure it is in good working order prior to class). 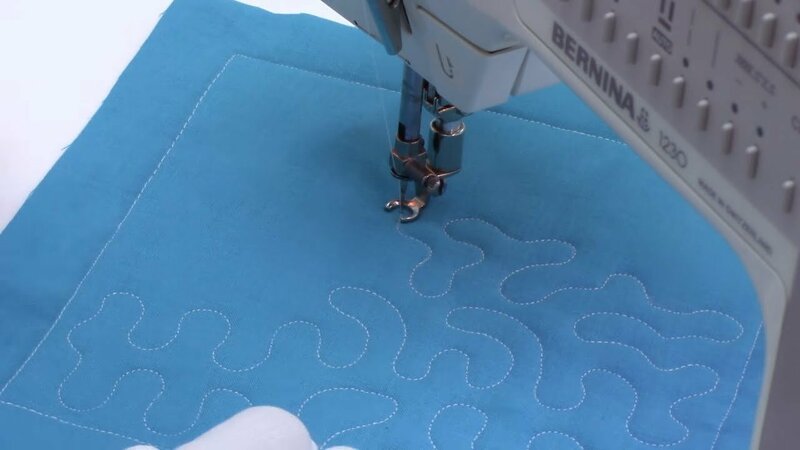 Make sure that you are able to lower the feed dogs so that you are able to do free motion quilting. Bring the accessories that came with the machine in case we need them. make sure to have a couple of empty bobbins (one can be wound with the thread you will be using in class) and a small thread scissors. We will be spending the majority of our time learning different aspects of free motion quilting. (If you have a Bernina BSR - feel free to bring this as well). 1 package of TOP STITCH sewing machine needles, size 80/12 is preferred. You may also use: Sharps, Microtex, or Quilting needles. 1 spool of dark colored (a color you can clearly see on white fabric) 100% cotton thread preferred. (Make sure you have this same thread wound on your bobbin prior to class). 50 weight cotton thread is preferred. Purchase approximately 2 yards of fabric. You will need to cut this into 24 squares - each measuring 10-12 inches. PLEASE HAVE THESE CUT PRIOR TO CLASS AND HAVE THEM PRESSED AND READY TO GO. Feel free to bring extra fabric squares so you can practice more quilting. You can buy batting by the yard at Quilter's Haven - approximately 2 yards. Please buy 100% cotto or 80/20 cotton batting (low loft). You will need to cut this into 12 squares - each measuring approximately 10-12 inches. PLEASE HAVE THIS CUT PRIOR TO CLASS. You will have extra batting left over so I suggest you bring it to class in case you want to make extra samples. (You will need one square of batting for every 2 fabric squares). Minimum of 4 students or class is subject to cancellation.